With over 25 years’ experience in the telecoms & network industry, Comtek is Europe’s fastest growing provider of multi-vendor repairs, spares, re-manufacturing and support to the telecoms & networking industry. Deinstallation & Hardware Consignment Sales are also part of our growing range of services. We have recently built a state-of-the-art 60,000ft warehouse in Deeside, North Wales, specifically to host our Hardware Consignment Sales service. Comtek’s deinstallation & sales consignment service enables customers to effortlessly turn their unused Telecoms & Network equipment into hard cash. There is no cost or risk to the customer for this service. Our specialised team of highly-skilled engineers can either work independently, or alongside the customer’s own engineers, to deinstall and remove excess equipment from the owner’s network infrastructure. Once the equipment is transported to Comtek’s dedicated consignment stock warehouse, the equipment will be tested and assessed in our in-house testing laboratories. Any necessary repairs or re-manufacturing will be performed as necessary. Comtek’s dedicated sales team will then use its global customer-base to resell the tested/re-manufactured surplus products, along with a full 12-month Comtek warranty. Profits from the product consignment sales will be split between Comtek and the original owner of the equipment. 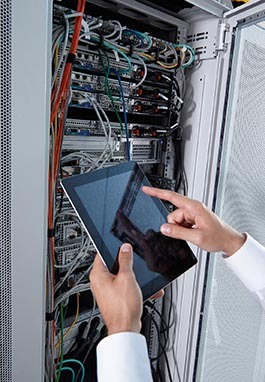 Let us help you to maximize the financial return on your excess network infrastructure.